Subscribe to our Newsletter to be informed of our new products and promotions! 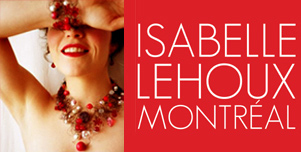 Welcome to "Isabelle Lehoux Montreal" online shop. We sale creative jewellery, handmade in our workshop at Montreal by 2 designers, Isabelle Lehoux et Céline St-Pierre. Adjustable necklace on stainless steel wire, no attach. Earings longs on copper wire, pearls and stars. Artistic necklace with medallion in bloom. Handmade jewellery, original and artistic necklace that attaches to the front while crossing. Creative jewellery on copper wire, moove with your taste. Necklace no attach, original and easy to wear. Necklace on copper wire with chain and beads. Rectangular wood bracelet. Unic and simple. Adjustable bracelet. Design necklace, geometric chain, black copper wire and different forms beads. Design necklace, Stainless steel on vegan suede cord. Ring with stainless steel chain and one cristal. Adjustable. Hypoallergenic. Handmade tiara, confortable and very light to wear. Dentelle bracelet on colored copper wire, stars and pearls. Earings longs on copper wire. Long necklace on stainless steel chain and artisanal Royal medallion. Jewellery, handmade adjustable pearls ring on copper wire. Two metal leaves earrings who give you slim style. Very light to wear. Hypoallergenic. Handmade jewellery, unic and design ring on braided adjustable ring. Hypoallergenic. © Isabelle Lehoux Montréal. All rights reserved.